It’s that time again…Genre is back in town. This month’s theme is Arabia. If you’re not familiar with the Genre event, it’s a great affair that celebrates different cultures, diversity and genres in Second Life. Whether it’s the furry community, which was last month, or this month’s Arabia theme, it helps people discover different flavors of SL. If you don’t want to go full-on nights of Arabia, think about incorporating these gold sandals from Frogstar with a flowy skirt, or the delicate filigreed nose-ring and earrings from AZE paired up with a slinky club dress. 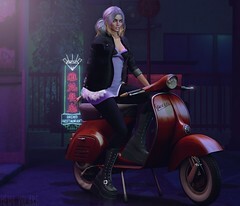 I encourage you to go check out the fab things at Genre! More to come.